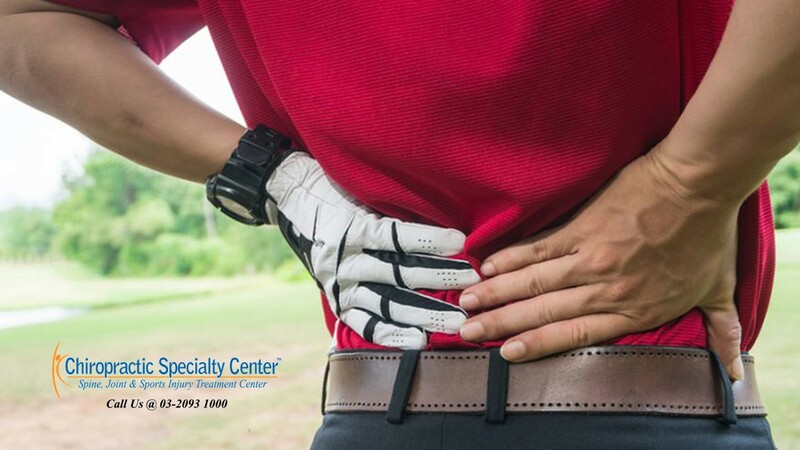 Mechanical lower back pain is a very common reason for a golfer to seek help from health care practitioners. In younger golfers, sudden growth spurs can be a cause of lower back pain as this may cause a relative tightness of the thoracolumbar fascia and hamstrings. This relatively reduced flexibility can increase the stress on the spine. Whereas in older golfers, degenerative changes at the hip may be a contributing factor for the mechanical lower back pain. Osteoarthritis of the hip can lead to decreased internal rotation of the lead hip during the swing and the additional force will be transferred to the lumbar spine. Therefore, the structures in the lumbar spine exerted by this additional stress. Sacroiliac joint dysfunction is a very common cause of lower back pain in young and active populations. Research has shown that up to 40% of lower back injuries are associated with sacroiliac joint dysfunction. The presentation of sacroiliac joint dysfunction can mimic a low back strain or the pain can radiate into the buttock or posterior thigh. The joint is normally quite tender upon palpation and the pelvic landmarks can be asymmetry when compared from side to side. Leg length difference from side to side can cause asymmetry force transmission through the sacroiliac joint and the spine during weight bearing activity. A club that is not suitable for the golfer can result in poor swing mechanics and this can lead to mechanical low back pain.